I have to admit to being a little bit sceptical about the need for another Toy Story film when it was first announced a year or so ago. The first two films are, in my opinion, classics, capturing all the imagination of childhood, full of lovingly realised characters and friendships, not to mention some hysterical gags. But after the beautiful and, dare I say, challenging Up and Wall-E, I couldn't believe that Pixar re-visiting our old plastic friends could lead to anything more than an enjoyable, if unnecessary nostalgia trip. Pixar had grown up, and were confidently covering some quite difficult subject matter in their more recent films. What else could be done with the Toy Story crew, other than milk the cash cow by slapping a 3D suffix to the title? Well, forgive me Pixar, for I had too little faith; Toy Story 3 is a stunning tale, every bit the equal of both its predecessors and Wall-E and Up. A long time has passed since the events of Toy Story 2, and Woody, Buzz and co. are feeling a bit neglected. As their owner Andy has become a teenager, they've been left sitting in the toy box, whilst friends like Bo Peep and Wheezy have either been donated to charity or simply thrown away. Andy's off to college, growing up, and growing out of love with his toys. He decides to take Woody along for the ride, but pack the other toys up in the attic, which they resignedly accept as a sort of retirement period. However, a mix-up sees the gang left out as trash, a betrayal Andy would never have intended, and a quick-witted Woody thinks fast, sending his pals off to the SunnySide daycare centre instead. While Buzz and co are initially thrilled to be played with again, all is not what it seems at SunnySide, and it's soon down to Woody to help get the gang home again. It's a rip-roaring adventure, every bit as imaginative as previous entries into the series. Again the Pixar team have mined memories of childhood to great effect, pulling together a hilarious cast of recognisable childhood toys, wonderfully animated, and playfully poking at our expectations of each character. Mr Potato Head, Hamm the moneybox and Buzz Lightyear still get big laughs, but the funniest scenes are reserved for newcomers the Ken and Barbie dolls. The too-cool-yet-sickly-sweet pair have a fiery, hilarious romance in the film, and Ken's camp and oh-so-misunderstood outlook on fashion and life are superbly written. But for all the humour on show, Toy Story 3 will be best remembered for its heart. It's truly touching, and downright sad at some points. The toys are coming to terms with the loss of their owner and best friend, moving on from relationships and dealing with the grief of losing their pals. It's never patronising, and some of the finer points may go straight over a younger audience's head, but it goes pretty deep for a children's film. A 15-minute sequence at the end of the film is one of the most suspenseful, intense and heart-wrenching scenes you are ever likely to watch. I defy you not to cry, or to at least scream "nooooooooooooooooo!" out loud at one particularly magnificent moment. This being a tech-blog after all, I'll give a quick review of the 3D tech on show during my screening of the film. 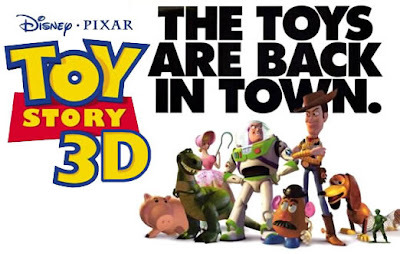 We were lucky enough to catch Toy Story 3 in a 3D RealD showing on a Sony 4K screen at the Apollo Cinema on London's Regent Street. RealD screenings on 4K screens have a few significant differences compared to the technology used in other 3D cinemas. Sony's kit projects two images to both eyes simultaneously, rather than high-speed alternating left and right images for each eye used elsewhere. It makes for a far more comfortable viewing experience, and those who have suffered from 3D-induced headaches in the past should seek out a similar screening near them. The 4K display itself is also far sharper than other cinema screens I've seen, though the necessity for 3D glasses throughout still remains an issue, with brightness levels suffering once they are over your eyes. As for the 3D effects on show in Toy Story 3, apart from a few notable scenes, it's yet another film that hasn't quite managed to capture the sense of depth and movement as well as Avatar did. I wouldn't be too upset if you can't catch a 3D screening of the film however, as thankfully the story itself is excellent either way. A masterfully told adventure, full of belly laughs and some of the most touching scenes you're likely to ever see in a film, I can't recommend Toy Story 3 highly enough. For a kids flick, this will be as emotionally resonant with adults as it will be entertaining for the starry-eyed children it's aimed at.